The way the training club and swing method teaches feel is by using a counter-intuitive approach (SWINGING THE OPPOSITE WAY), that challenges and shatters the pre-existing mental patterns of a poor golf swing, and releases the natural flow of a proper or good (on plane, on balance, maximum rotation) golf swing. A right-handed golfer uses a short (in length), weighted, left-handed (molded grip with split hands) UnSwing Training Club™. How does it work? It’s simple. It forces you to swing the opposite way so that there is nothing for your brain to grab onto but the new, balanced and powerful swing that the UnSwing Training Club™ instantly produces. No ball is needed and the club can be used just minutes a day, anywhere, and anytime. The concept of practice swinging the opposite way not only is revolutionary, but this may be the only training aid where you never hit a golf ball, and you can practice indoors – it’s radical. UnSwing™ - Truly a revolutionary golf training / fitness club and swing method for men and woman of all ages and playing abilities. The UnSwing™ Training Club and Swing Method is the only patent pending system on the market today that teaches feel. The radical approach of the UnSwing System combines swing training and fitness that dramatically improves your balance, power, and speed. The unconventional, uniquely designed UnSwing Training Club, not only strengthens your weak side, it teaches you to unwind, and relearn fundamentals. Additionally, the unique UnSwing Method creates a new sense of calmness in the mind and helps golfers get comfortable with the uncomfortable™ – creating a fundamentally sound, dependable, repeatable swing on the golf course. The UnSwing System forces a new swing awareness combined with heightened concentration, and calmness. With one, 5-10 minute practice session, you learn the feeling of balance, timing (sequence of the body and arms working together) and explosiveness - the feeling of a fully finished (on balance) golf swing. The training club and swing method help produce the widest swing arc possible maximizing the body’s unique potential to produce maximum length and distance. • Creates new sense of balance on both sides of the swing – wider swing arc produces optimum accuracy and distance. • Forces new awareness/connection with the mind and body that promotes concentration, calmness, and better tempo – golfer is now comfortable with the uncomfortable. Enhances feel of proper hand positions throughout the swing. Creates a sense of stress free, perfect take-away. You learn how to consistently repeat a take-away that produces an on-plane shaft and perfect hand/club-head position. Enhances feel of holding off release for maximum power at impact (Lag Drill). Promotes perfect address position (posture, grip, setup). Club can be used anywhere/anytime for practice or warm-up. Dramatically improves balance, core strength, and re-energizes all muscles used in the golf swing. • UnSwing™ Method – Unwind and relearn fundamentals. Create new swing awareness. Learn tempo under pressure. The UnSwing Training Club develops a new sense and feeling of a more powerful on balance swing while also producing a more relaxed, calm, mental process. The result is maximum distance and accuracy due to the fact that UnSwing helps produce your widest swing arc possible. UnSwing instantly produces a new feeling of a proper swing (on plane, on balance, proper timing/tempo). The golfer using the UnSwing training club is now able unlearn bad habits that typically appear during play on the golf course – especially when under pressure. In addition to learning a new feel and experience a “WOW” factor with the very first use, you can use the UnSwing method on the course even during play. By doing this, you can learn to relax and hit better golf shots and lower your scores. You can actually improve your swing and get better while you play on the course! What Sets This Golf Swing Training Aid Apart? Why Lefty? First, the club’s design and use gets you comfortable with the uncomfortable – that’s the essence of golf. Secondly, there is no golf ball to hit which takes the pressure and anxiety of hitting a ball out of the equation. Due to this radical approach, golfers using UnSwing make a new connection with their mind and body during their swing and build instant confidence producing a dependable, repeatable swing during play on the course. Using the UnSwing Training Club as a warmup prior to play or practicing any time (inside or outside), the golfer develops stronger balance, flexibility, core strength and re-energizes ALL muscles used in the golf swing – not just the muscles you have been using swinging your normal direction. Getting comfortable with the uncomfortable is just the beginning and UnSwing is a golf training aid/fitness club that helps you improve daily. Golfers using UnSwing overcome a variety of swing faults along the way and the unique UnSwing method moves golf training to a whole new level. Use UnSwing for practice or warmup 5-10 minutes a day to fix a variety of swing faults (setup/address, take-away, body rotation, full finish etc.). The UnSwing Training Club and swing method improves balance, strengthens your body’s core while at the same time makes you more golf-flexible. This improves your game using the best of golf biomechanics combined with instant results. Ultimately, golfers using UnSwing produce a more explosive, natural, and repeatable golf swing that results in better golf shots and builds confidence on the golf course. 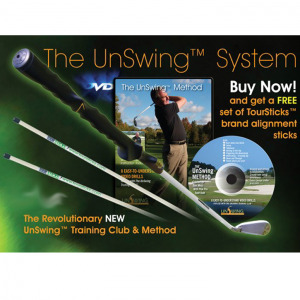 The UnSwing Training Club and swing method was created by Dan Moss and UnSwing Golf, Ltd is located in Beachwood, Ohio. UnSwing Golf, Ltd is a leader in golf and fitness training aids both nationally and internationally. At UnSwing, our goal is to dramatically improve your swing fitness and bring a greater sense of awareness (feel) to your game. It was our vision to develop a radical training aid and swing method that teaches feel that could be used anytime anywhere for just minutes a day. If you have any questions regarding the UnSwing Golf Training System, please give us a call, we would be happy to help you with any questions you may have. Write an online review on the UnSwing Golf Training System, and share your thoughts with others.